General Mills is a 150-year-old company. You have definitely heard of their famous cereal brands such as Trix, Cinnamon Toast Crunch and even their new cereal brand Tiny Toast. You surely grew up eating Cheerios, Betty Crocker cakes, Hamburger Helper and Häagen-Dazs ice cream. You might not know that today they also own Annie’s, Epic (amazing jerky), Larabar and Cascadian Farms. They produce and market more than 100 brands in 100 markets and there is one woman at the marketing helm of this enormous operation. 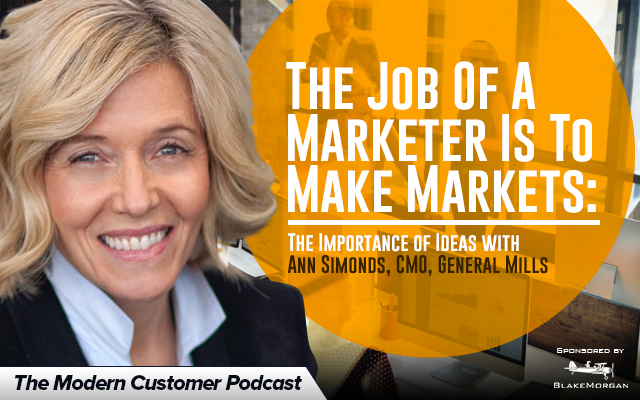 Her name is Ann Simonds and she is the chief marketing officer of General Mills. From content to social media to traditional advertising Simonds has a lot of responsibility. But that doesn’t stop her from taking the time to do things such as make frequent trips to the grocery store to watch her customers in action. In this podcast you will learn about how Simonds takes the roof of the house of her customers to get to know what their needs are.